Hi all! I’m sorry there’s been no updates on my end for a long time. I was actually planning to get back into the swing of things when…. Photobucket, the site I PAY to use to host all the photos on here (and my other blogs) has pulled the rug out from under their customers feet and banned third party hosting (so the images you see on this blog for instance) unless you pay a ridiculous amount for the privilege of using their website. I’m not willing to pay $400 a year just to do that when there are plenty of alternates, so I will be moving all the images (one by one by one) to a new hosting website, and going through every single post to update. According to the official Postacollect website we will get some news about the Gotochi cards in mid-August. My goal is to have the site fully transferred over by then in case they announce the new 2017 cards. Meanwhile, please expect some trouble with the pictures until then. And if you notice anything besides not seeing the pictures (like I uploaded the wrong picture to a post, broken links etc.) please feel free to let me know! Thanks for sticking with me. Let’s look forward to collecting together! So… I was really hoping the 8th set of postcards would come out around the same time as last year’s, but they have not. I’m leaving for a trip from tomorrow through the end of March so if the postcards become available during the two weeks I’m gone, I will not be able to update the blog until I get back in April. I do have some regular posts queued so there will be usual updates, just no new cards. So see you in April, and here’s hoping 2016’s postcards are worth the wait! But don’t worry, loyal readers of this blog (all 12 of you)! I will still be updating with English explanations and pictures of each postcard, as well as with news and updates as usual. I know I am eagerly awaiting the 8th set which will probably come out in March or April, so stay tuned! It has been announced on the official website that there will be a Postacollect event in Tokyo on April 23-26. It will be held in JPTower Kitte basement floor 1 in Chiyoda-ku (JPタワー・KITTE地下1階　東京シティアイ（東京都千代田区丸の内2-7-2）) from 11am to 7pm (6pm on the 26th), and will feature a number of panels and events, including a Giant Mt. Fuji postcard you can take a picture with. I’m not sure exactly what each panel will be discussing (the theme is “travel and gotochi cards” which doesn’t tell me a lot) but the event sounds like fun! And it looks like participators will receive a mini-card for free as well! I, unfortunately, wont be in Tokyo during that time, but I hope some fans can go and enjoy the event. Read the official post here. Along with the addition of the new 2015 postcards, Postacollect’s website also stocked more pink and grey official folders. However as anyone interested in them may have noticed, they sold out EXTREMELY quickly, and now there is in some cases only 1 or 2 left, if any. Thankfully, due to popularity, there will be another stocking of the folders. The next time you are able to buy will be April 17th from 7pm Japan Time. All 7 folders in both colors will be restocked, so if you missed your chance to get a set, here is another! Read the official announcement in Japanese here. [News] 2015’s New Gotochi Postcards have arrived! I have some exciting news! Today, Monday the 9th of March, the new 2015 Set 7 postcards have gone live! 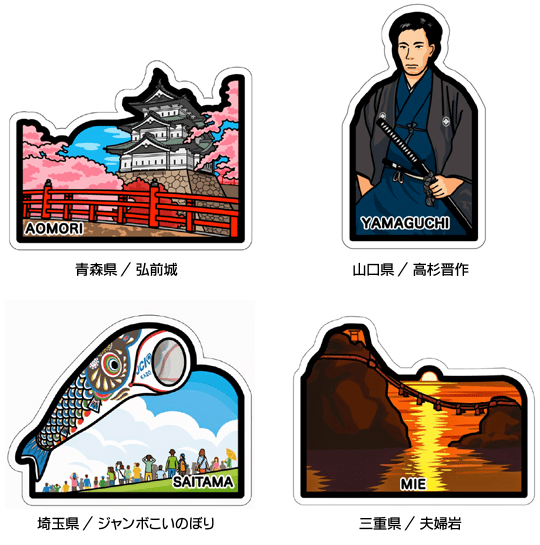 This beautiful new set of postcards will be sold starting from March 20th at local post offices across Japan. Considering for the past two years the new postcards have been announced in April, I was definitely caught off guard… but very excited! Moreover, the Official Postacollect Binders will refresh and will be available, also from March 20th starting at 7pm. Finally, the new Set 7 Binder will also be for sale then as well. I’ll be working this week to update The Collection with the new set. Meanwhile, you can sate your curiosity with the Set 7 Flier and visit the official website to view them as well.